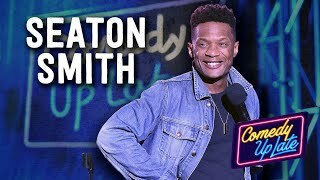 SEATON SMITH IS A COMEDIAN & ACTOR. IN LATE 2014, SEATON MADE HIS TELEVISION DEBUT AS ‘MOTIF’ ON FOX'S MULANEY. VULTURE NAMED HIM ONE OF THE 50 COMEDIANS YOU SHOULD KNOW IN 2015: "HE’S BURSTING WITH ENERGY IN A WAY THAT SETS HIM APART IN AN OVERCROWDED STAND-UP SCENE." He’s performed at over 200 colleges across the country and he has headlined shows across the world, appearing in international comedy festivals such as Montreal Just For Laughs, Melbourne Comedy Festival, and the Iveagh Gardens Comedy Festival in Dublin.